The Contemporary Art at the Gallery of the Municipality of Corfu . 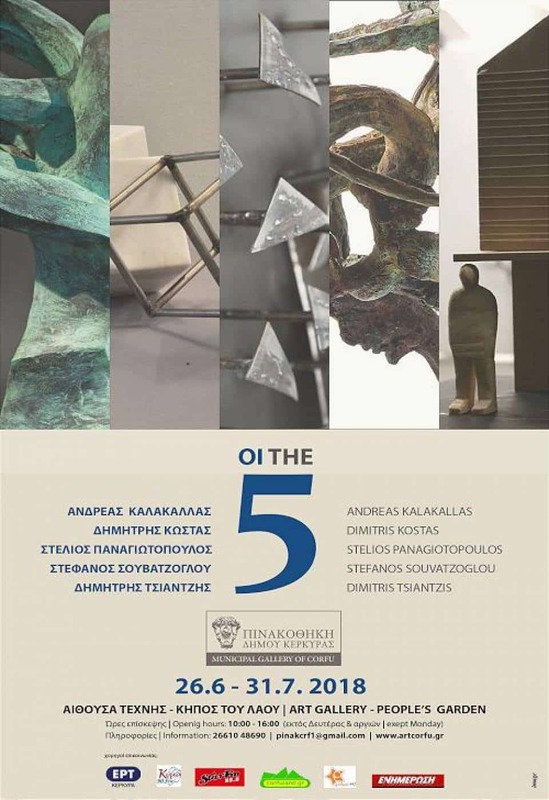 From 26 June to 31 July, five contemporary artists “5” exhibit their works for the first time in Corfu. From 26 June to 31 July, five contemporary artists “5” exhibit their works for the first time in Corfu. These are sculptors Andreas Kalakallas, Dimitris Kostas, Stelios Panagiotopoulos, Stefanos Souvatzoglou and Dimitris Tsantzis,graduates of the Higher School of Fine Arts, with a common route to the sculpture workshop of Professor Giorgos Houliaras. “They formed a group as they joined them in common sculpture searches. They create works of marble, metal, wood, recyclable materials and ready-made objects, within the framework of a human-centered theme in its individual and social dimensions. By doing regular meetings between them, sharing thoughts and concerns about their own artistic creation, by jointly and critically contemplating modern visual activity, they work by cultivating a common artistic ethos unrelated to ease, hastiness, sloppiness. Keeping the core of values ​​that joined them, they open up to new stimuli by interacting and evoLong Islandlving their personal idiom. The report is part of a wider effort of the Municipality’s Art Gallery, to acquaint the public with a relationship of familiarity with modern art and especially with contemporary sculpture. In addition, the aim is to establish the People’s Garden as an open-air art exhibition space for the summer season (the beginning was 2017 with the Katherine Wise exhibition of wooden sculptures) aimed at a wide range of visitors from the permanent inhabitants of Corfu to thousands of visitors.